I was treading carefully on a mixture of stinking animal and human refuse, wet mud and miscellaneous junk that I dare not think about. PHOTO: RAKSHA KUMAR. Bombay (now known as Mumbai) enamours me like it has many people. While the plane lands over the city, you see a seamless mix of shanties and high rises. It is not so inconspicuous on the ground. Riding a local train from Santa Cruz to Malad East, I gazed at the best and the worst of living conditions of the people of Bombay. I was in the city to report on the raising real estate prices in the city’s slums. As I reached my destination in Dharavi, one of the largest slums in Asia, there was a strange sensation in my stomach because I was treading carefully on a mixture of stinking animal and human refuse, wet mud and miscellaneous junk that I dare not think about. After a few minutes, I reached the home of Rashid, the auto driver. We need people’s shoulders to cry on when we are in distress, you see. 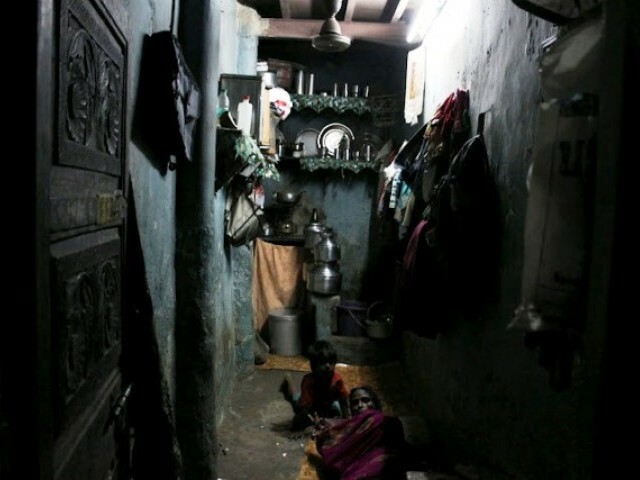 Rashid lives in a 10ft-12ft room that doubles as a kitchen and a tiny portion in the corner is marked off as wash area. In order to reach the bathroom, Rashid and his family trek down at least five minutes outside their house to a dingy public toilet in the far corner of their small, crowded neighbourhood. The toilet, Rashid tells me has not had water for the past two days and in any case, there is no certainty that one would get to use it when one wants. We have to wade through the queue. The six members of the family share a coir mat and sleep on the hard cement floor. Khalida, Rashid’s wife, recycles her limited utensils to cook and feed her family. The house is regularly flooded in the rainy season. And when this does happen, the family first saves the children’s books and only then moves to protect other items in the house. Sitting on an inverted tin box, the only seating arrangement in the house, and sipping tea that was specially made for me, I could only think about how distant the privileged classes are to the realities of families such as Rashid’s. Unless one ventures out and forces oneself to be a bystander in the lives of those like Rashid, this sort of poverty will remain an exotic fantasy in the minds of those with cosy apartments. Considering slums and substandard living conditions make up large parts of the cities of India, understanding them becomes the first step in trying to alter the situation. The common reaction of the privileged class is to cringe and shudder at the very thought of passing by a shanty town in a car. This, or they just resort to simply complaining at the very existence of this sort of housing. Spending some time as spectators, will also bridge the palpable mental gap between the more privileged and the less privileged. In a country like India, the more we understand the underbelly of our cities the better we can perform as a cohesive urban unit. Currently, the distance between the two urban worlds of comfort and distress seem unbridgeable. But, the future can certainly be different if we desire. After having a small chat with Rashid’s family while I was walking away from their house, I felt a small tug on my sleeve. Turning around, I saw 11-year-old Salma, Rashid’s daughter, smiling at me. Could you please give me your number? “Yeah… Sure!” I fumbled and handed my card. “I will call you for advice on what college I should go to in a few years,” she said. I left with a huge smile on my face. But that doesnt mean we have to stop spending on military when the western neighbors have attacked us 3 times and release mujahideens regularly and the northern neighbors have occupied one third of Kashmir and are now staking claims on Arunachal Pradesh…. maybe indian govt is not as intelligent as this fellow rashid is. i have seen worse conditions in slums. however, it is because in rainy season that they first save the children’s book that the girl is speaking english. they are in a slum and are suffering hard, but a few years down the line his devotion towards his childrens education will really bear the fruits. contrast this with your country where talibans are bombing girls school. I am not from Mumbai and I rarely visit it. I went to Mumbai a few weeks back and the area where my work was, was located next to the Ambanis’ titanic house. This country of the Mahatma has been taken over by the billionaire hoodlums. These elite, billionaire, millionair hoodlums of this country don’t brandish a baton or an a.k 47. They use economic terrorism on the poor and lower middle class of this country. “When the rich overindulge, poor suffer” – Mr. Righty Rightist. We need modesty in this country. We Indians are one of the most immodest and bigoted population on earth. When we came across Pakistanis/Bangladeshis, we show off our nukes. When we came across whites, we act like slaves. When we came across the blacks, we slither away like a scared snake. And when we come across the chinese, we shut up! Scrap all the IPLs, Billion dollar defense deals, billion dollar houses, misleading and vulgar bollywood. We need to look at ourselves in a way, we never attempted before. I appreciate your effort to bring to the fore the conditions of the Indian urban underbelly – however, I do not agree with your sweeping statement that the privileged class cringe/ shudder/ complain when the have to go through such places. I have lived in Mumbai and I have visited slums in Thane and Chembur where my house maid and office attendant stay respectively. I have been there along with several of my colleagues for Ganesha festival as well as for Janmashtami – and I have been pleasantly surprised by the number of privileged people who go there and bond with the residents. In many locations there is no choice but to traverse through such localities and some of them a famous for their tea shops, vada-pav outlets and kabab joints which are frequently visited by the privileged class. I guess most of us who do cringe, shudder or complain is because many simple things that can be done by the residents and the government to alleviate some of the problems never gets done.. These slums are house tax free, utility charge free (most houses get power supply illegally) and even when the residents have been provided with better housing under slum rehabilitation schemes, they give those houses for rent (illegally) and get back to the slums..
Karachi and Mumbai were comparable at time of independence with Karachi somewhat more prosperous. Both are port cities and hub of trade and commerce and the largest megapolis of their respective country. In Lyari which is a suburb of Karachi, 2000 police have not been able to establish their writ after 7 days of operation. This is just one suburb and one ethnicity’s gang. There are at least 2 more equally powerful if not more powerful gangs that are an open secret. People are firing rocket launchers at the police. I was born and brought up in Mumbai. I honestly do not remember seeing a gun with any civilian. Even police would only have pistols not automatic weapons and rifles. It’s kind of funny. We Indians refer to certain parts of our cities as slums. World Cup Cricket watched by us in big screen!!! people from all over india (mostly poor) come to bombay to secure their future. as they can’t afford to buy a decent accomodation they start dwelling in slums or roadside (most cheapest), even if it is illegal. no property tax; electricity tephone, ration card can be managed. after few years politicians (vote bank) promise them to build a permanent and legal accomodation, all free. problem solved, a poor person who can’t afford to buy a decent flat now owns a legal flat in one of the costliest city in the world. its all business and trick. You are getting the wrong picture – the issue is not whether Dharavi is prosperous or not, but whether slums of this nature exist (and they do in plenty). Let’s not get caught up in a pointless discussion on which part of Bombay or India they actually are in. thank you for appreciating my comment. but what you are missing is that the current years are the most crucial years too. population is exploding, expectations are soaring, and if resources are not allocated in proportion to requirement then, you will lay complete waste of a very promising generation: the same generation which is working wonders in other countries. frustration will rise so acutely that you will only find it increasingly difficult to manage even the bare necessities. Funny how all the Indians are trying to potray that Pakistan is in even deeper waters instead of commenting on the blog itself. You might be developing but you have to accept your shortcomings as well. @BlackJack: I isually tend to agree with your viewpoint. I differ from you on your post to Murugan. His post is a perfect example to reinforce the subject of the blog. That the slums maybe dark and dingy to the person viewing them from outside but inside people have hope and believe that their future will be better than their past if they put in the effort. Murugan lives in Dharavi which is Asia’s largest slum and instead of feeling bitter or entitled, he has confidence that he can have a better life by the dint of his hard work. Not sure why you are putting him down. I had a chance to Visit Delhi earlier this year as part of a trade delegation and must admit that i was very much impressed with the city of Delhi . It has gone truly International( probably the only one in South asia) and you can feel it as you land on their very impressive airport comparable to Heathrow/Changi. The city has made immense strides in their public transport with a flawless underground ( sad to say but we dont have anything like that in pakistan). Air is much cleaner than lahore/karachi, Roads impeccable. There were pockets of shanties which were visible here and there. but i was told plans are on way to redevelop them. The suburbs of Delhi ( Gurgaon) are collage of glitzy malls, multinational corporate towers and some shanties spread here and there which are a bit of an eye sore for an otherwise an extremely fancy suburb. Most pakistanis in the delegation had a smilar opinion. Top American graduates heading to India for employment!!! Do we have anything to boast about? There is more to Bombay (don’t like the name change) than Dharavi. Even Dharavi is not about poverty.The real story of Dharavi is it’s indomitable spirit of rising above it’s conditions and making a success of it. @Asad: A recent book titled “Behind Beautiful Forevers” by Katherine Boo documents discrimination against Muslim slum dwellers in Mumbai. Also, according to Sachar Commission report, produced by a committee led by a former Indian chief justice, Rajender Sachar, Muslims are worse off than the Dalit caste, or those called untouchables. Some 52% of Muslim men are unemployed, compared with 47% of Dalit men. Among Muslim women, 91% are unemployed, compared with 77% of Dalit women. Almost half of Muslims over the age of 46 can not read or write. While making up 11% of the population, Muslims account for 40% of India’s prison population. Meanwhile, they hold less than 5% of government jobs. @ Suresh: The fact is that Orangi is nothing like Dharavi in terms of the quality of its housing or the services available to its residents. While Dharavi has only one toilet per 1440 residents and most of its residents use Mahim Creek, a local river, for urination and defecation, Orangi has an elaborate sanitation system built by its citizens. Under Orangi Pilot Project’s guidance, between 1981 and 1993 Orangi residents installed sewers serving 72,070 of 94,122 houses. To achieve this, community members spent more than US$2 million of their own money, and OPP invested about US$150,000 in research and extension of new technologies. Orangi pilot project has been admired widely for its work with urban poor. I do find that you just use false data and half-baked truth to highlight your points….. Seriously Guys- someone needs to be seriously updated. The 9000 Crore(INR) Dharavi redevelopment project is already on. I have been visiting Delhi regularly for the last couple of years as part of Theatre Group workshops, and i second an opinion to someone in the comments section who remarked about Delhi’s stride in city development. Beleive me folks the transformation of the city has to be lauded. Considering the population and problems of Delhi, what has happened there can be compared to an elephant tied with chains and finishing 100 mtrs within 10 secs. One thing I can understand from your post is – you want to tell your people that India is far worse then Pakistan and life of Muslims are hell in India, keep doing this and after 10 years the gap between India and Pakistan must have been widened even further…Examples – India’s each industry size is far bigger then your country, Example are:- IT more then $100 billion, according to Mckinsy Pharma industry size will be $20 billion in 2015, India is the world largest motor bike manufacturer, More than 3.7 million automotive vehicles were produced in India in 2010, making it the sixth largest in the world, India amoung the few countries who have reached moon, Indian Remote Sensing satellites (IRS system) is the largest constellation of remote sensing satellites for civilian use in operation today in the world, with 10 operational satellites. @Usmani: Brother we are not denying the poverty in India, but it doesn’t mean we have to only see the negative aspects and discredit the achievements, poverty can not be eradicated overnight it will take time, India have lifted a massive 330 million people out of poverty during the past two decades, and we have high hope for our future and truly believe we can lift the entire section of India out of poverty in next 2 to 3 decades…Please watch the below video where you can see how the youths of two big countries of world India and China thinks about their future and their positive hope…. Years ago there was only ONE country. From Karachi to Mumbai .. From Lahore to Delhi … the people were ONE. Today FOOLS fight over their COUNTRY being the BEST. First of all I thank the author for this article and shedding light on what goes on in Mumbai. That being said this is of course not a problem only in Mumbai or India but of course all over the world. I was born in Pakistan and saw some of the most terrible things imaginable being a norm for the very poor. India and Pakistan need to stop fighting and unite. Politicians make people fight to stay in power and they will never solve anything. when u talk about muslims as being vilens than thiunk about it who runs the underworld in mumbai which religious groups attack mumbai yes u know the answers!! n bye the way u see the vilen in movie is muslim n didnt saw herro who is muslim in reallife!! why do u guys show taliban as vilen the r also muslims plzz dont do it!! !